I wrote this in response to the prompt at The Write Practice. I will keep working on it, but this is my first response to the prompt. For a long time our grandparents were distant figures, spoken of in whispers, who my Dad had fallen out with. He gruffly accepted Christmas presents from them for us, but they were seldom spoken of. So the announcement that they were coming to visit led to a flow of questions that threatened to roll our parents over and send them half way around the world. I can’t remember what Dad said, but I recall Mum cooking roast and tidying the house till it was the most spotless I ever remember it and just saying ‘Just be polite, best manners.’ We had a clothes line machine that hung up in the house and stretched from one end to the other of a room, usually the lounge. It was up a lot in winter to save us using the dryer and we would run under the clothes and pretend they were a jungle. My Mum used to tell me to ‘always dress your best for going out, you never know who is going to see you. You might just get offered a job.’ I would pull faces and think she was mad. Every day is not a job interview. When our grandparents arrived our grandmother was the talkative one. They gave us gifts, fake jade tikis from Air New Zealand, a Spanish dancing doll for me and other trinkets for the boys. They were English but had recently retired to New Zealand. Granddad wanted us to call him Wal and Grandmum, Pat, but we wanted to name them, Nana and Poppy like most kids in our street called their grandparents. We settled on granddad and Grandmum. The first meeting had us all sitting up to attention at the table whilst Mum and Dad served up a meat and three vegetable meal for us all. I realise now I remember the meal well because we often didn’t eat well back when I was little. We were putting on our best show. More questions were brewing in my head. The visit went by with each of us being introduced in turn to our grandparents. I felt the strain but Granddad seemed refined, scholarly and gentle. It was obvious to see where my Dad got his intellect from. I wonder how he could do without his Dad for so long. Grandmum seemed full of words, but I really can’t recall what she said. She was like a ball of feathers and fluff, but I was to find out she was quite artistic. After this visit, letters flowed from my grandmum and she would tell me how granddad was. They were always decorated with pictures made from leaves and plants. And when I was fourteen years old, after years of letters and birthday cards with one or two dollars in them, I went to New Zealand with my Dad and spent a couple of weeks with my grandparents. My memories of my granddad then are much stronger. 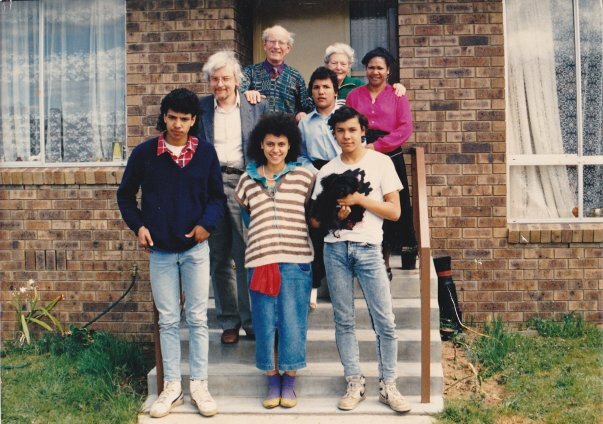 He wore a plaid hat, and took us to see a Maori lady who he learnt the language from. She took us to a Maori meeting house. This was my first trip away from Australia since moving there as a baby. I am not sure why I was the chosen grandchild to visit. Perhaps it was because I wrote back to every letter from my grandmother and became the voice of my family to them. Granddad loved his pet dogs and his garden. Sometimes my grandmum would send me pictures of him with the dogs or busy at work in his beloved garden. I enjoyed being in New Zealand meeting with them. We went to the beach house and walked along the sand with their racing dogs and one of my uncles who lived with them. I noticed them gently chiding my Dad and that Granddad liked to make wine (my Dad doesn’t drink) and they asked my Dad if he would try some, to which he politely said ‘no.’ I wrote postcards home. My grandparents know how much I liked to write, and they gave me a very special present after this New Zealand trip. It was a red typewriter to write books one day.When I went home I began to type letters to them, and send them poetry. The next time I saw my grandad, he looked over some of my poetry that I excitedly grabbed from my room to show him, and said I had real talent. I was filled with so much happiness after that comment and it added to my determination to be a writer. Whatever happened between him and my Dad and led to such strained relations I will always remember Granddad fondly for this gentle encouragement that was to drive me to never give up writing and one day write a piece about a red typewriter. I think it must have taken courage for our grandparents and parents to patch up their troubles, so that for a little while we had grandparents. The last time I spoke to them, I was in New Zealand and hoped to take my husband to meet them for the first time. However, my Granddad said we couldn’t come because my grandmum was ill. I was to find out later she had alzheimers and he didn’t want us to see her that way. He always protected and supported his wife, even if it meant a rift with my Dad. I was to find out the reasons for this rift, but that is another story and it doesn’t detract from the closer relationship we were to have with our grandparents for just a bit of our lives. I will always remember my Granddad as being one of the first champions for my journey to want to be a full time writer. Thanks for sharing this June. It is a good reminder that there is quite often a good reason behind the things that people do that appear unreasonable and unkind at the time. Your grandparents sound like very caring people. So true, people don’t often share their reasons perhaps due to embarrasment or protection of others. Family histories are always interesting for what we can unearth in them. Lovely, June, you have really brought your grandparents to life for me. Sounds to me like your grandparents were really special people. It’s good that you have your memories of them to share. Thank you. What a lovely piece of writing. You really conveyed the emotions of your relationship with your grandparents.